Discovered on a rocky spit on Triquet Island, around 300 miles north of Victoria, Canada, the remnants of an ancient village have surprised archaeologists. Possibly alluding to one of the oldest settlements found in North America, the discovery in question here (made last year) is 14,000 years old, thus making the village almost 10,000 years older than the veritable pyramids at Giza. I remember when we get the dates back and we just kind of sat there going, holy moly, this is old. What this is doing is just changing our idea of the way in which North America was first peopled. Now interestingly enough, there are several hypotheses regarding the Bering Strait land bridge (also known as Beringia) that connected Alaska with Siberia and how it was used by a few thousand immigrants to cross into the Americas (from eastern Siberia). However in spite of the existence of this land bridge during the period of the settlement (the land bridge was finally submerged by the sea around 11,000 years ago), the researchers have conjectured that the inhabitants of the village were more likely to have come by boats. In essence, the coastal route was probably more favored by the prehistoric populace rather than the ‘romanticized’ land route of Beringia. To think about how these stories survived all of that, only to be supported by this archaeological evidence is just amazing. And finally the good news for history enthusiasts pertains to the fact that this scope of the discovery is still not complete. 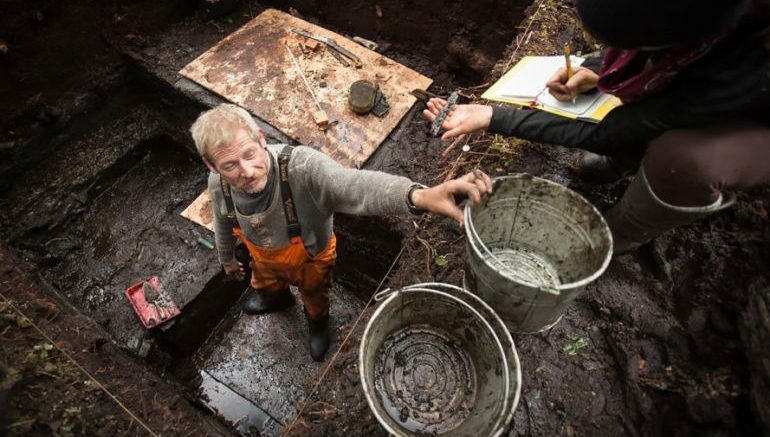 In that regard, the researchers are looking forth to excavate other islands in the proximity to unravel more remnants of lost ancient settlements on the western Canadian coast. Images Courtesy of Hakai Institute.